The FAEE and EtG hair alcohol tests are used to determine the amount of alcohol an individual has consumed over a 3 to 6 month period of time. AbuseCheck™ is a service offered by the BioPharma Institue. The BioPharma Institute has been offering pharmaceutical, biotech, and healthcare products and services directly to professionals and consumers since 1997. In early 2008, the institution added AbuseCheck™, a highly sensitive and extremely informative Hair Alcohol Abuse Test (HAT) to its product line. The FAEE and EtG hair alcohol tests are used to determine the amount of alcohol an individual has consumed over a period of time. The tests are sold individually or bundled together. Additionally, AbuseCheck™ offers both 5-panel and 9-panel Hair Drug Abuse Tests (HDT), creating the ultimate solution for substance abuse testing. 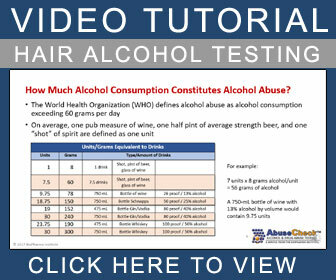 The AbuseCheck™ Hair Alcohol Abuse & Drug Abuse Tests are commonly used by corporations, parents involved in child custody cases, guardians of teenagers, and legal professionals to prove or disprove a recent (up to 6 months) history of alcohol or drug abuse. FAEE, a byproduct of alcohol metabolism, can be used as an indicator to assess the amount of alcohol a person has consumed over the past 2 to 6 month period. Basically, the higher concentration of FAEE present in the hair the more alcohol which has been consumed during the period of detection. EtG, a byproduct of alcohol metabolism, can be used as an indicator to assess the amount of alcohol a person has consumed over the past 3 month period. Basically, the higher concentration of EtG present in the hair the more alcohol which has been consumed during the period of detection. Hair drug testing is a convenient and effective way to measure historical drug use. When drugs are consumed, byproducts of the drug metabolism are incorporated into the structure of the hair. The sensitivity of testing hair for drugs is high, allowing segments to be tested in 1 to 6 month periods. © 2019 - BioPharma Institute. All Rights Reserved.